Port Campbell is a coastal town in Victoria, Australia. Start off your visit on the 9th (Sun): get great views at Loch Ard Gorge and then head outdoors with The Arch. On the 10th (Mon), you'll have a packed day of sightseeing: take a peaceful walk through The Redwoods. Start your trip to Port Campbell by creating a personalized itinerary on Inspirock. Melbourne to Port Campbell is an approximately 3.5-hour car ride. You can also do a combination of flight and bus; or do a combination of train and bus. Wrap up your sightseeing by early afternoon on the 11th (Tue) to allow time for travel to Uluru-Kata Tjuta National Park. Kick off your visit on the 12th (Wed): trek along Uluru Hiking Path, view the masterpieces at Walkatjara Art, then identify plant and animal life at Red Desert Reptiles, then explore the striking landscape at Kata Tjuta, and finally head outdoors with Walpa Gorge. Get ready for a full day of sightseeing on the 13th (Thu): don't miss a visit to Uluru, contemplate the waterfront views at Mutitjulu Waterhole, then hike along Kuniya Walk, and finally appreciate the views at Valley of the Winds. For photos, where to stay, and more tourist information, read Uluru-Kata Tjuta National Park trip builder . You can do a combination of bus, train, and flight from Port Campbell to Uluru-Kata Tjuta National Park in 10.5 hours. Alternatively, you can do a combination of bus, train, shuttle, and flight; or drive. Expect a daytime high around 42°C in December, and nighttime lows around 24°C. Wrap up your sightseeing on the 14th (Fri) early enough to travel to Hamilton Island. Here are some ideas for day two: play a few rounds at Hamilton Island Golf Club, take in the exciting artwork at Hamilton Island Art Gallery, then take in the waterfront activity at Hamilton Island Marina, and finally enjoy some friendly competition at Hamilton Island Bowling Alley. To see maps, ratings, reviews, and more tourist information, refer to the Hamilton Island trip maker . You can fly from Uluru-Kata Tjuta National Park to Hamilton Island in 18 hours. Expect a bit cooler weather when traveling from Uluru-Kata Tjuta National Park in December: highs in Hamilton Island hover around 34°C, while lows dip to 28°C. Finish up your sightseeing early on the 16th (Sun) so you can travel to Whitsunday Island. On the 17th (Mon), enjoy the sand and surf at Whitehaven Beach and then explore the activities along Hill Inlet. 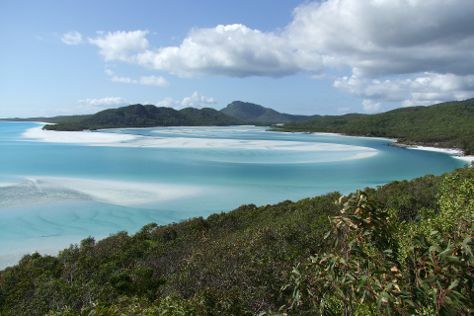 Keep things going the next day: head off the coast to Whitsunday Islands National Park. To see maps, more things to do, ratings, and more tourist information, refer to the Whitsunday Island vacation planner . Explore your travel options from Hamilton Island to Whitsunday Island with the Route module. Plan for slightly colder nights when traveling from Hamilton Island in December since evenings lows in Whitsunday Island dip to 24°C. On the 18th (Tue), wrap the sightseeing up by early afternoon so you can travel to Cairns. Keep things going the next day: admire the sheer force of Josephine Falls, then explore the striking landscape at Babinda Boulders, and then look for all kinds of wild species at Tablelands, Waterfalls, and Spanish Castle. To find more things to do, photos, and other tourist information, you can read our Cairns online vacation planner . You can fly from Whitsunday Island to Cairns in 2 hours. Other options are to do a combination of bus and flight; or take a train. In December, plan for daily highs up to 36°C, and evening lows to 26°C. Finish up your sightseeing early on the 20th (Thu) so you can go by car to Port Douglas. On the 20th (Thu), look for gifts at With Sugar. Here are some ideas for day two: browse the eclectic array of goods at Sunday Market Port Douglas, then don't miss a visit to St Mary’s by The Sea chapel, then look for all kinds of wild species at Opal Reef, and finally take some stellar pictures from Trinity Bay Lookout. For where to stay, ratings, photos, and other tourist information, use the Port Douglas trip itinerary maker website . You can drive from Cairns to Port Douglas in 1.5 hours. Alternatively, you can take a bus; or take a shuttle. Expect a daytime high around 36°C in December, and nighttime lows around 26°C. Wrap up your sightseeing on the 22nd (Sat) early enough to travel to Magnetic Island. On the 23rd (Sun), head off the coast to Magnetic Island National Park, look for all kinds of wild species at Nelly Bay to Arcadia Trail, and then stroll through Geoffrey Bay. On the 24th (Mon), you'll have a packed day of sightseeing: take an in-depth tour of Magnetic Island Museum, tour the water at your own pace with Pilgrim Sailing, and then step off the mainland to explore Magnetic Island Forts Walk. To find photos, reviews, traveler tips, and tourist information, refer to the Magnetic Island trip planner. Traveling by combination of shuttle, flight, and ferry from Port Douglas to Magnetic Island takes 5.5 hours. Alternatively, you can do a combination of car and ferry; or do a combination of shuttle, bus, and ferry. In December in Magnetic Island, expect temperatures between 37°C during the day and 28°C at night. Finish your sightseeing early on the 24th (Mon) so you can travel back home.